This family boat is in the water and ready to go! This boat has dual Crusader 270hp engines, The port engine has just been overhauled and has 0 hrs. Starboard engine has 101 hrs since overhaul. Both Velvet drive inboard transmissions have been overhauled and also only have 101 hrs. Mechanically it is in perfect shape. Stand up shower and toilet. This boat has just been professionally detailed inside and out. The helm is equipped with a VHF radio and a Ray Marine GPS/Depth finder. The boat is located at Westshore Marine, 2175 Whitfield Rd. in Port Perry. 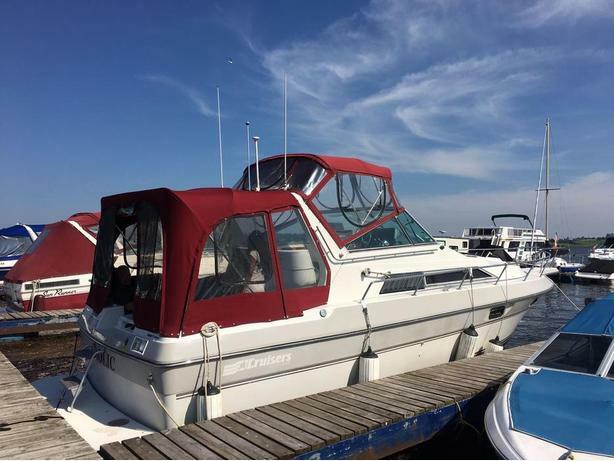 Please call (no texts) 905-985-2658 to view this great boat.